For the last couple of years, I spent the majority of my waking hours in an American high school. I’ve known for a long time that I wouldn’t go to college after high school. I also knew for a long time that I wasn’t thrilled about spending my days in school. Just a few weeks after releasing my first book, I decided to exit school. I didn’t exactly drop out, as the title of my book might suggest, but I did leave an entire year early to pursue my career. Here’s a timeline of how I did it. By my sophomore year of high school, however, I was disillusioned with school. I was taking all the advanced classes and paying for AP tests that I knew meant nothing. I felt frustrated at the amount of useless work I had to do. None of it led to real learning, and I was only progressing when I wasn’t in school. The second I left the school building, I would immerse myself in all sorts of learning endeavors. I learned all kinds of awesome things like the strategy of poker, how to play better chess, and how to program. A belief that I was as capable as an adult in the workplace. I didn’t want to stay in school anymore given the possibilities of making money and succeeding in a real career. These were the roots of a much larger movement to leave school and start my career quickly. From the beginning of the school year, I was not happy to be back. I came from working 40 hours a week with real adults doing real work with real implications. Now, I would be filling out graphic organizers and notes pages to get a grade that didn’t matter. Wonderful. Right before my summer internship had ended, I bought a domain name. It was thirdbreath.com, and I decided that it would be a company for me to practice graphic design. I would market myself as the designer behind thirdbreath and build a portfolio. The hope was that even if I never scored much freelance work, I would have a collection of work to show to design studios in Austin. From there, I hoped that someone would take a chance on me and give me a job. Once school started, I knew that thirdbreath presented a meaningful opportunity to learn a lot of new things. Priority: become a much better designer. As I explored Dribbble, a site where some of the best designers share their projects, I could tell that my work wasn’t up to par. That wasn’t discouraging, though. In fact, it motivated me to learn as much as possible and give it a shot. Taking advice from Tim Ferriss podcasts, I decided to reach out to some designers and ask them for help. Around the same time, I began sending cold emails to local companies to ask for graphic design work. For the first three months of prospecting, I heard absolutely nothing. Nonetheless, I was lucky enough to have two adult friends pass some design work along to me. Between these two projects, I made nearly $2,000 before the end of 2017 doing graphic design. I could tell that there was a real possibility to continue designing and make it into a career. Though my cold prospecting emails weren’t doing so well (yet), my outreach to possible mentors did great. I reached out to talented designers in Austin and around the world. All that responded were friendly and warm in speaking to me. They were more than happy to talk to a seventeen-year-old who wanted to design for a living. I even decided to go to a Dribbble meetup in Austin. I knew that there would be some excellent designers there and that if I made one or two good connections, it would be a worthwhile experience. That was an understatement. The meetup was hosted by Funsize, a product design agency here in Austin. I was sitting next to one of their designers during the talk at the event, and he was friends with one of the speakers. After the presentation, I decided to talk to him and ask if he could introduce me to his friend that had spoken. I ended up in a conversation with two of the speakers and the owner of Funsize. I had plenty of questions and asked them about their experiences with design agencies and how they got started. They were also plenty interested in me when I told them what I was doing and how old I was. By at least a half-decade, I was the youngest person in the building, so the novelty helped a lot. They were impressed that I decided to start networking at such a young age. I exchanged business cards with them and went home, knowing that I had changed my life forever with this one encounter. I waited a few days before I decided to email these people and re-introduce myself. When I did, I was paranoid about my writing. What should I say? What do I want from them? Will I sound stupid? Will they respond? Alas, after a long time spent poring over these short messages, I hit send. I also kept on prospecting via email in hopes to find design work. Through small solo design projects, I was building up a modest portfolio. It gave me a small amount of experience that still serves me well to this day. At one point, I created a logo a day for nearly two months. That was my crash course in starting, working on, and executing design ideas. That’s something you can only do through working on projects. They weren’t great, and few of the things I created at that point were worth anything—but it was work. To be the noun, do the verb. I wanted to be a designer, so I decided to do the verb, design. To further grow as a designer, I would need to get experience working under much better designers than me. They could critique my work at a high level, and that would be my real design education. But at least at this point, I had something to show for my ambition. I could now show someone that I was willing to put in the work required to become better. Maybe, I thought, someone would hire me, and I could get that further growth from them. Since I knew I wasn’t going to college and would have to start my career some way else, I dropped out of all my advanced classes in school. Now, I could pass my classes without any homework and focus on the real learning I was doing outside of school. I also attended some classes a year early to get enough credits to graduate six months early. As I did this, I got many questions because my peers realized I was serious about not going to college. I suppose at first it seemed like fiction. “You’re really not going to college? But you could get into any school you want!” That was true, but it wasn’t the path for me. In the meantime, I was also learning more about marketing in hopes that I could market my business as a designer more actively. At one point, I attended a local meetup for entrepreneurs that I expected, again, to change my life in one way or another. I met a man by the name of Omari Broussard. At first, I didn’t expect much from him. He was quiet and reserved as the rest of the group talked about content marketing and personal branding. At on point, he interjected, grabbed a marker, and started drawing on the whiteboard. He drew a map of how influencers make their money, generate leads, and grow personal platforms on their expertise. Sparing you the details—too many of which I don’t precisely remember— he said one thing that changed my path forever. There are two authorities in the world: doctors and authors. I still remember sitting in that room and immediately grabbing my pen to write down that bit of insight. I knew it meant a lot, but I wasn’t exactly sure how, yet. He continued to describe how a book, either through self-publishing on Amazon or an ebook, could completely change your marketing efforts. It would add to your credibility and become your new business card. Don’t have something to say, have a point of view. As I put these two—and many other dots—together, I thought about writing a book on the one thing I had a viewpoint on: school. Everyone seemed to care about what I had to say on school because they asked. Not only that, they asked for advice on how they could either do better in school or avoid college. Somehow, I was answering these questions. This would be my side project. I had scored two other design projects for my design operation, thirdbreath. I’d made a little bit of money and learned a whole lot in the process, which is all I could ever want. Also, my prospecting emails started to pay off. Agency owners, CEOs, founders, Presidents, and VPs began to respond to me. Important people at important companies. I developed relationships with many of these people that I will continue to keep in touch with for years. I was still in school going into 2018, so I couldn’t focus all my efforts on working for these people. Many had offered me jobs for the summer and expressed interest in what I was doing. Nonetheless, I did have a side project that would turn out to be more significant. On May 7, 2018, I released my book, The Dropout Manifesto. The book had been in the works for at least half a year and was finally coming to a close in May. As you’ll read in the book, I was in a messed up school system until the very end. Days before the book came out on Amazon I was still getting in trouble at school for not being compliant with every petty request of my teachers. It made for the perfect introduction to my book, which many have told me was their favorite part of the entire piece. 15 days later, I left school. I still graduated, though I tested out instead of graduating in the traditional sense. It’s as close as you can get to a GED in the United States without obtaining a GED. You can call me a dropout, in that sense. In dropping out of high school, I had a plan. I had four job offers that I was contemplating, and I went into one of those companies to do an interview. I already planned on working for them over the summer, but I told them that I could start a bit earlier because I was leaving school earlier than expected. They had no qualms and were more than ready for me to start. I now work at that company here in Austin, Texas. I am in marketing, and my primary role is copywriting. I’m working under people that are much smarter than I am and genuinely growing as a writer and as a businessperson. The opportunity came from the email outreach that I’ve mentioned throughout this story. I developed all sorts of new techniques that I outline now in a video course called Hijacking Mentors. I got much better at writing email copy (though I’m still not amazing). I sent lots of emails and tried not to get discouraged. When the emails weren’t doing so well, I stopped and tried to learn why. The reply rates began to rise, and I got in touch with more new people in that short time than ever. It’s the entire reason I was able to leave school and have a job immediately, even as a high school dropout. My peers, who still have another year of high school left, will continue in school and make small amounts of money with part-time jobs. Many of them will not gain real work experience until well into their 20s. Some of them will, of course. That’s why I wrote the book after all, and I hope to connect some of those kids to other people here in Austin to help them get jobs. I want them to succeed because the school system doesn’t seem to. The point still stands, however, that I am ahead on the path to a career. It’s funny to hear my friends tell me to have a great summer. This isn’t a summer break for me—it’s life. I work now and have a full-time job for the foreseeable future. To some, that might be depressing. For me, it couldn’t be more refreshing. I’m excited about the work I do and equally enthusiastic about the prospects of doing other things in the future. I know that work doesn’t have to be a burden, and I’m also confident in my ability to change course if it ever becomes one. Just like I did with school. Here’s to a bright future. No matter where it takes us. 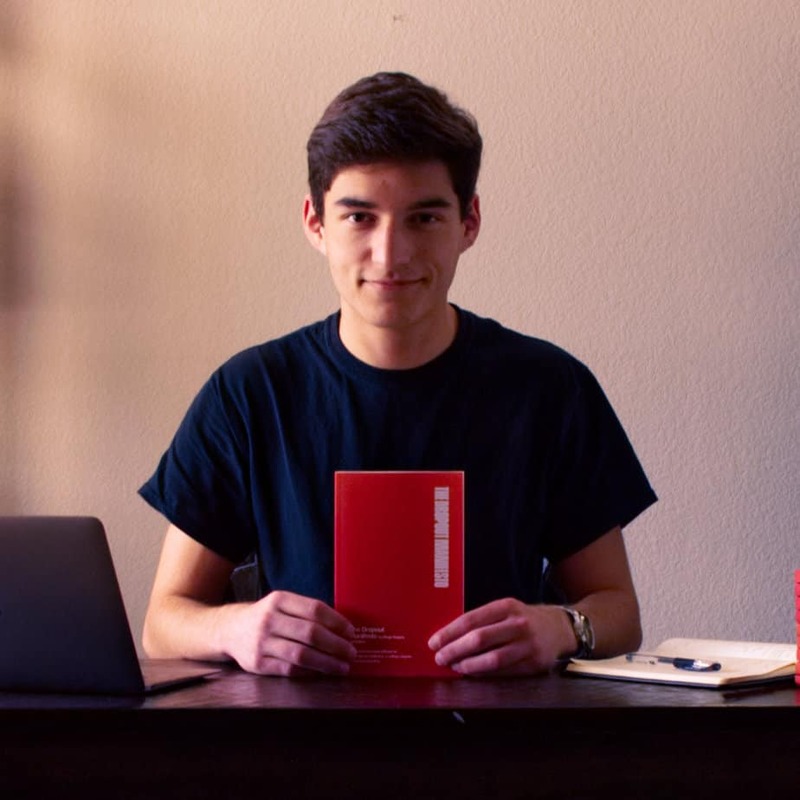 Diego Segura is currently 17 years old living and working in Austin, TX. He wrote a book called The Dropout Manifesto, and writes articles and daily reflections on his website, diegosegura.me.